Using the principles behind the formation of sandcastles from wet sand, North Carolina State University researchers have achieved 3-D printing of flexible and porous silicone rubber structures through a new technique that combines water with solid and liquid forms of silicone into a pasty ink that can be fed through a 3-D printer. The finding could have biomedical applications and uses in soft robotics. In a paper published today in Advanced Materials, corresponding author Orlin Velev and colleagues show that, in a water medium, liquid silicone rubber can be used to form bridges between tiny silicone rubber beads to link them together – much as a small amount of water can shape sand particles into sandcastles. 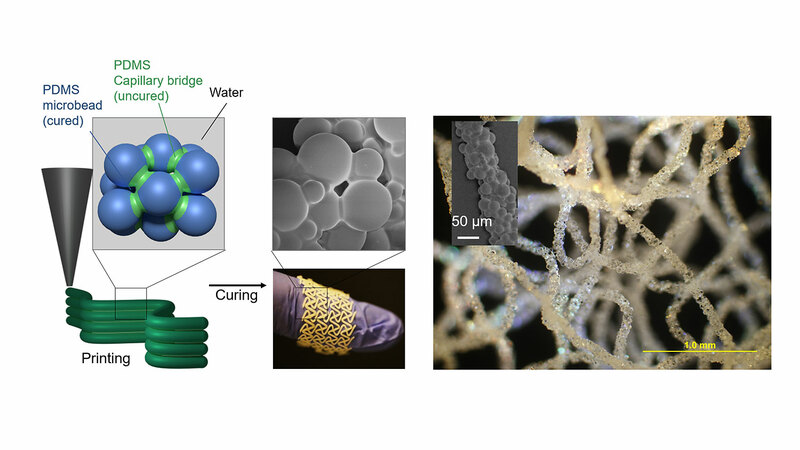 Interestingly, the technique can be used in a dry or a wet environment, suggesting that it has the potential to be used in live tissue – think of an ultraflexible mesh encapsulating a healing droplet, or a soft bandage that can be applied or even directly printed on some portion of the human body, for example. “There is great interest in 3-D printing of silicone rubber, or PDMS, which has a number of useful properties,” said Velev, INVISTA Professor of Chemical and Biomolecular Engineering at NC State. “The challenge is that you generally need to rapidly heat the material or use special chemistry to cure it, which can be technically complex. The paper is co-authored by first author Sangchul Roh, an NC State Ph.D. candidate; NC State graduate student Dishit Parekh; Bhuvnesh Bharti, a faculty member at Louisiana State University; and Dr. Simeon Stoyanov of Wageningen University in The Netherlands. The research is funded by the National Science Foundation under grant CBET-1604116 and by the Research Triangle Materials Research Science and Engineering Center on Programmable Soft Matter under grant DMR-1121107. NC State has filed a provisional patent on the new technique. Abstract: Three-dimensional (3D) printing of polymers is accomplished easily with thermoplastics as the extruded hot melt solidifies rapidly during the printing process. Printing with liquid polymer precursors is more challenging due to their longer curing times. One curable liquid polymer of specific interest is polydimethylsiloxane (PDMS). We demonstrate a new efficient technique for 3D-printing with PDMS by using a capillary suspension ink containing PDMS in the form of both pre-cured microbeads and uncured liquid precursor, dispersed in water as continuous medium. The PDMS microbeads are held together in thixotropic granular paste by capillary attraction induced by the liquid precursor. The resulting capillary ink could be 3D printed and cured both in air and under water. These PDMS structures are remarkably elastic and flexible, and could find a broad range of applications in soft materials and biomedical microarchitectures.